What I do when I am sick. Being sick for so long was really trying on my mental state, but winning all those contests, just when I needed a lift, was a blessing. I am finally feeling better enough to get out and do more around the house, so hoping to finally get back to normal soon. One of the prizes I won, was a wonderful hand made sewing box from Alma Allen. It is so beautifully done and love the fabric she chose for mine. It was filled with wonderful trims and two patterns, that I can use to make gifts this year. The bundle of fabric is beautiful, and I think it would make a nice quilt for my DIL who loves florals. 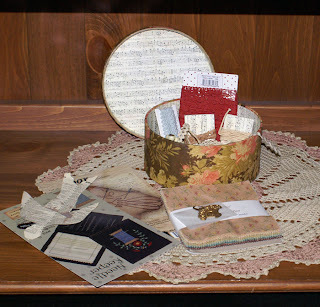 Or maybe I will make a quilt for the new guest room, when it gets done;) I was thinking this box would make a nice theme for the room, sort of victorian prim. I already have a cherry desk in there too. Maybe I can use some of the trim in my new project. If you visit their Blog, she has a wonderful tutorial on how to make your own. I will show the other gifts later, each one is special and I want to show them off individually. Most people rest or sleep when they are sick, not me. I tend to get milder symptoms for longer periods of time, so it is good in way, bad in others. While I was sitting on my duff, I decided to start some new simple projects for fun and to give me something to do. I still had a piece of locker hooking backing, and lots of fabric, so I made a locker hooked rug. I thought I could do it in a couple of days, it took four and I finished binding today. I am not an expert, I just made it, and tried to go with a rug look this time. 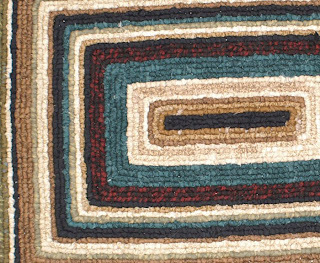 I think it might be too geometric and mod looking to go with my hooked rugs, so will figure out a place for it. I think if you use all homespuns, it would make a really nice prim rug. I still need to take pictures of the items I won. Today I received my basket and it is so wonderful. I want to give each item it's own page, since they are all so wonderful. This is a closer look to show the colors better. I used a mix of materials and weights. I also got an idea for a wall hanging from a photo I saw. 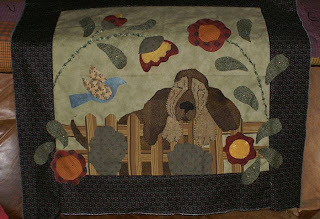 I took the dog and fence and made them into an applique and then started adding things around him. 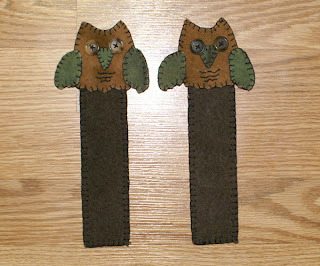 I still have sewing to do and I am thinking of adding some butterflies and other garden creatures. It is a work in progress. I will embellish it after I add all the pieces. Since I haven't had a lot of energy this weekend, and I wanted to show some of my prizes that I won, I decided to have Betsy, my prize from Joyce at RagPatchPrimitives. I just love Betsy, she is so much nicer in person, pictures do not do her justice. She is so prim and there are so many details like the antiqued lace shawl and her twisty tail that has a bell on the end. 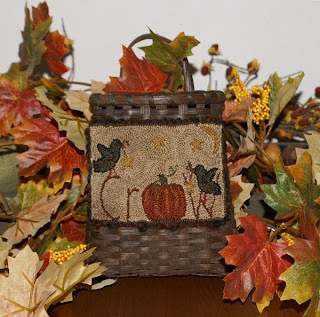 Be sure to check out Joyce's blog and etsy store, she has a lot of wonderful items and also the T.P.I.D.T website. They have a wonderful group of talented artists who sell finished products and patterns. 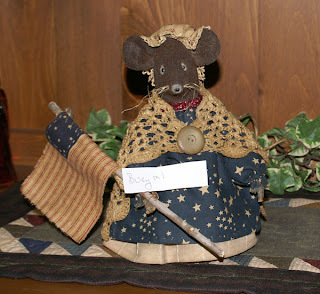 Here is Miss Betsy, she is going to pick the name for the contest. Busym1 (Michelle) is the winner of the signed book by Lynette Anderson. Please send me your address, so that I can mail you your book. I really feel bad for everyone who didn't win, I am horrible at this and wish I could give you all a copy. The good news is, Lynette is also running a contest for a copy of the book, so you can enter at her site, as well. I appreciate all who entered and gave me feedback. I will be working on Christmas presents, which I won't be able to show you, but I will be working on my own things and hopefully some new patterns for the holidays. I wanted to post pictures of the new gifts that I won in the contests, but I am still sick, this is the longest flu I have had and I got the cough too, so on cillin for that. I am hoping it kicks in soon and I can feel good enough to get out of the house before I go bonkers;) Today I finished a punch and started a locker hooked rug. 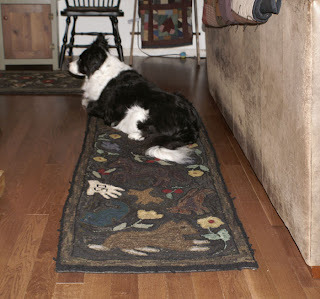 I thought it would be something mindless to do and I need more rugs for the house. So, instead of waiting till tomorrow after the contest (See below), I will let you know now. 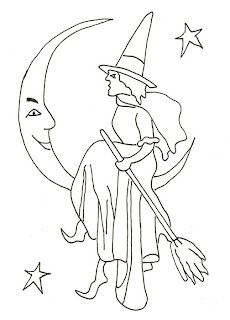 Since it is no fun losing and I can only pick one winner, I am giving a copy of my witch on the moon pattern, for you to use as a punch, hooked or an applique. I had planned on making patterns with her and the woodland witch, but never got around to that either. You can use this pattern for your own personal use or to give as a gift, but I would prefer if you did not use it for sale. Tomorrow night I will announce the winner of the contest, (see below, it is not too late to enter) and next week I will share the goodies that I received from the contests I won. Next month I will have another contest, near the end of the month, since it is my bday, so keep your eyes open for that. Last week, Lynda Hall sent me a couple of patterns as a happy present, since I have been sick. I love keeping busy, I cannot just sit and do nothing;) I will be using them to make presents for some of my friends, so I was delighted to receive them. 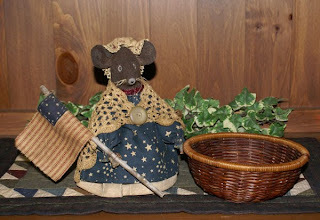 If you have never seen Lynda's patterns, her site is a must see. 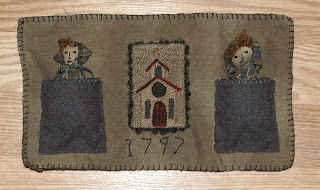 She makes the most beautiful quilts and has a wonderful way with color and fabric to bring a primitive look to each one. I love seeing her decorations as well, she changes them out with the seasons. She also has a newsletter, so be sure to sign up. This month she is running specials on patterns for her newletter subscribers. And don't forget, if you haven't commented on the contest, be sure to leave a comment and get a chance to win a signed copy of Lynnette Anderson's new book. Sometimes we have that dark cloud that follows us around, which is usually the case for me and sometimes you just have one of those weeks where you are surprised by good fortune. I guess in my case, it is the adage, is the glass half full or half empty? I have been sick with a flu for over a week, so stuck at home and I am getting cabin fever. On the other side, I have won three contests which have given me a pick me up, which is much needed. So, I think it is time I have a contest and offer my fellow bloggers, readers and have no idea who you are visitors;) I do enjoy new visitors though and I do check out your blogs. I also enjoy comments, good or bad and love feedback. So, without further rambling, here is what I am giving away this week. A copy of Lynette Anderson's newest book, "A Gathering of Crows". This is a signed copy that features quilting designs by Lynette; a quilt, a tote, as well as other quilted goodies. And.... there are two designs that I worked up in punch for her, using her designs. So, if you love to quilt, sew and punch, this would be a great prize for you. Now here is the catch, lol. 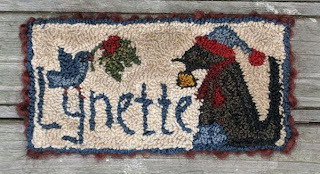 You have to go to Lynette's site and look for the new punch patterns that she has published now. You can find them now, on the first pages of her blog, but you may have to hit more blogs to find them, later in the week. Then tell me in this comment section what one you like the best and why. I really do love feedback and it will help lynette and I, in future designs. Here is a preview of the book. The tote design and the quilt in the background. And here is one of the punched pieces I did for the book. I have also done a few punched pieces that Lynette is now selling and new ones will be coming in the future, so be sure to check out her site while you are there. I have been working on a punched project for a special friend and today I made a teeny tiny stocking for a group challenge we were doing today. I think it took me longer to stitch this, then to punch one;) The pattern was in an old issue of good housekeeping. 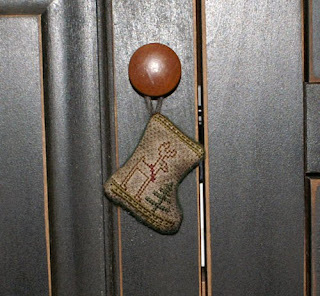 It is two inches long, so I will add it to a christmas doll display. I have also been blessed with good friends who send me special presents, just because they are nice.Lori sent me a wonderful package today. I love the pumpkin and mat she made for me. The picture is in my kitchen, but I have it on my apothecary box, which it is perfect for. I also won prizes this week, I have no idea where that luck is coming from, never had it before, lol. So, when I receive the gifts, I will share them with you. Since I have been blessed so much this week, I will be having a contest this week. A little hint, it is a signed copy;) So, keep your eyes open for the contest. This is something I have been wanting to make for a friend and I finally did it this week. I got the original idea for an older issue of Create and Decorate and then ended up drawing my own church and redoing the dolls. It was a lot of fun to make and I would like to do more, but make my own version and style, next time. The picture is horrid as usual. The background fabric is a vintage looking green cloth, but shows yellow. Today I finally finished my runner. I did a yarn whip stitch around the edge and tucked under the excess backing and loosely stitched it to the back. 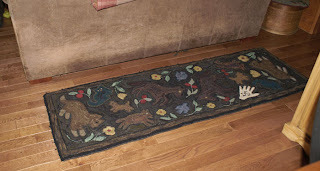 The rug still needs steaming and walking on, then as it flattens out more, I can redo the back after it has stretched. I also need to clip the leftover snippets on top. 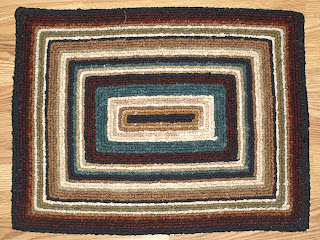 I am not sure if I want to make a big rug again. I would like to make one for my living room, but between the time it takes and struggling with it on the frame, I might stick with smaller ones. This is not a great picture. I tried an extra light, but with flash, it makes everything pop out in color. 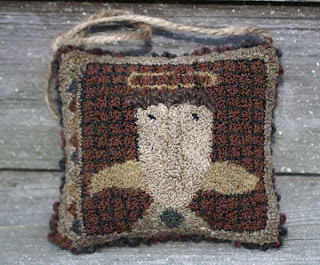 I used a lot of scrap wools in various weights and textures to give it more of an antique appearance. For some reason it looks like you can see the white edge underneath, but that is the black yarn edge. Flash really plays havoc with my rugs. One of the reasons I used scrap and rough wools was for this guy. This is his spot and he needed something he can lay on and run across without slipping. He seems to be pleased with it;) The rug is 78" long x 27" wide. I didn't feel like thinking too much, so went exploring on the web and found the neatest site with tutorials. 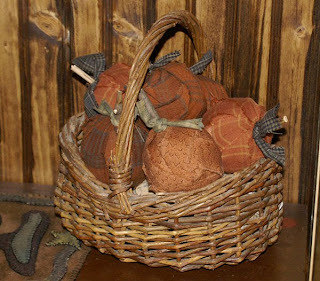 If you would like to make some yourself or find some other great ideas for gift giving, check out Wee Folk Art. There are lots of tutorials and I love the eye glass case with the birds. Now I need to practice up on my stitching. I would also like to use yarns and pearl cottons, but they do not go through the fabrics with the big needles I have. I would love suggestions on how other's use larger threads in their pieces. I have done couching, but i want to be able to sew it into the fabric. I wanted something mindless to do yesterday and I wanted some pumpkin decorations. I decided to make pumpkin scrap balls. I used medium styrofoam balls and started by sticking a piece of stick in the top. 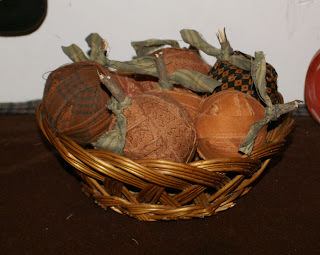 Then I ripped strips of orange colored fabrics and wound them around the balls. I tucked the last edge into the other pieces to hold it down. Then I took a strip of green and tied that at the base of the stem. Homespuns looks great for prim settings, and they do look more prim in person, than in the picture. The flash makes them look like blobs of fabric instead of strips. The second batch was for the bottom of the stairs on a bureau, and I wanted them to pop more, so I used brighter fabrics. I also ran out of medium and used some smaller balls in the mix. You could do this with larger styrofoam balls too, to make a simple display on your table. You can used green strips for stems or cut out leaf shapes with wool and some wire on top, as well. This is a great project for the kids too, no mess or dangerous objects to work with. Yesterday I had a punch frenzy and made another label for Lynette. I wanted to do a christmas one, so I used her designs and redid them a bit. This one I did using valdani black for the dog to match the dog she had as a child. 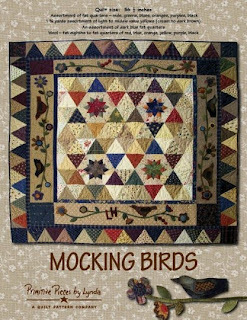 This week I received a copy of Lynda's new pattern, Mockingbirds. I just love this pattern and plan on making it as soon as I finish my others. 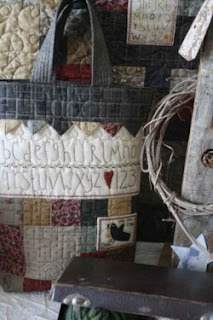 She has some beautiful primitive patterns and decorating on her blog and site, well worth the look.